You need help with your booking, or do you have a special question? Here you'll find the answers to the most frequently asked questions regarding your ski holiday. They are chronologically ordered from searching for and booking the perfect ski holiday, from arrival to the return journey. What types of reductions exist? We offer many reductions, such as age-related reduction and group reductions or even reduced prices for equipment hire. Further information regarding reductions and how you can benefit from those for your holiday, you can find here. How last-minute can I book? You can book up to one working day (Monday - Friday) before the start of a holiday, until latest 2 p.m.. Payment has to be made via bank transfer or with a card (debit or credit). From 2 weeks prior to departure we however do recommend to use a card, otherwise we will need to request proof of payment from yourself to process the bank transfer. Only after we have received valid proof of payment can we forward the required holiday information.Further information about payment can be found here. What does it mean to book "on request"? To book "on request" means that the room you are interested in is not in our guaranteed allocation of beds, and - after making your firm booking - the availability of the room will be requested with the accommodation. It could potentially take up to 7 working days to review the availability of the room and during this time period, you are bound to the booking. That being said, we generally receive an answer after about 3 working days. If the accommodation confirms the room, you will shortly thereafter receive your booking confirmation/invoice via e-mail. Should the room not be available, the booking cannot take place and we will promptly inform you via telephone or e-mail. We will be glad to help you in your search for an alternative accommodation. However, you are not required to accept our alternative offer should you not wish to. How can I redeem one or several gift vouchers? Vouchers can be redeemed according to the conditions on the voucher. The voucher number(s) can be entered into the respective box in the section of "Traveller 1", in the last step of the booking process. Voucher per person: In this case various voucher numbers can be redeemed per booking. Should the voucher value exceed the booking price, the outstanding value expires. A refund of the value is not possible. Should you have more than one voucher to redeem, please enter the codes all in the same box in the section of "Traveller 1" (e.g. 12345, 56789, 90123,...). The first voucher code applies to traveller 1, the second to traveller 2, and so on. Voucher per booking: Only one voucher number per booking can be redeemed. The validity may be bound to a minimum holiday price per person or per booking (as per info on the voucher). When a voucher is only redeemable per booking, the value will always be credited to traveller 1 (lead traveller). After having entered the voucher number(s) and the lead traveller's personal details you can click the button "Redeem voucher". Then you will see a new price calculation for your holiday, including the voucher amount(s). To finalise your booking, please fill in the rest of the required details and proceed with pressing the button "Firm booking". I've already booked. Can I still book additional services? Booking additional services (travellers, equipment hire, lessons, lift pass extension/upgrade, board - extra services dependent on the offer, see booking process) can be done either over the phone or by e-mail until 1 p.m. on the day before travel (has to be a working day: Mon - Fri), provided the remaining balance is paid by credit card. If you had originally selected to pay by bank transfer at the time of booking, please provide your credit card details over the phone. It is only possible to book additional services up to 19 days before the start of the holiday if you will be paying by bank transfer. An exception is booking additional travellers; this can be paid by bank transfer, if payment by credit card is not possible. Is a baby insured along with its parents? Babies are insured along with their parents, provided both parents have taken out insurance and registered the baby at the time of booking, ensuring that the baby is listed on the booking confirmation. Can I book a two-week holiday? As the majority of our holidays are offered for 7 nights, a 2-week package booking is unfortunately not possible. However, it is possible to book two individual weeks consecutively (check the availability of both dates beforehand!). If you wish to ski on all days, please include the lift pass extension for the 7th day to the first week booking. Please inform us immediately after making both bookings, so that the bookings can be processed accordingly. As these are two separate bookings, all necessary documents are sent separately by week. How do I find an accommodation suitable for disabled travellers and wheelchairs? Although we welcome people with disabilities, some of our accommodations are more suitable to choose than others. Once you have entered the basic search criteria (destination | persons | travel dates | duration) and run a search, you will see the advanced search options open on the left hand side of the page. This offers the possibility to select "Wheelchair-accessible" as a criteria under the category "Accommodation facilities". The list of results will then only include such accommodations which are generally suitable for wheelchairs. Of course, we will gladly contact your desired accommodation to bindingly request a disabled-friendly room for your travel dates. Please give us a call to inform us about such a request. Can I book a holiday as a minor? If you are the lead passenger of a booking and are a minor at the time of booking, we require a written consent form from your legal guardians. Please send the consent form as quickly as possible by e-mail, fax or post (please use this form), as it is not possible to process your booking without it. Is my data secured or encrypted? We operate with the newest encrypting technology called "Secure Socket Layers" (SSL) to ensure that all your data is only transmitted in an encoded way. SSL is know to be the most secure transmitting service for the Internet worldwide. Every exchange of data between your browser and our website which may include personal details is highly encrypted and therefore secured of being lost, manipulated or subject to error. Your personal details are in safe hands with us! For further information about data security, please see here. When and how does the payment have to be made? As soon as you receive the Booking Confirmation, a deposit payment of 25% of the total holiday price applies (travel insurance costs additionally, if applicable). The balance amount is due 6 weeks prior to the arrival date. If the booking is made within 6 weeks before the day of arrival, then the total amount is due at once. Payment can be made by bank transfer or credit card. The holiday documents can only be issued, when all payments have been balanced, earliest however 14 days prior to arrival in resort. How does payment occur via bank transfer? The fax number is: +49 221 33 60 62941 – please make a note on the fax: "payment@snowtrex.com". Please make sure the proof of payment is valid. The receipient is "TravelTrex GmbH". The bank details (account number and sort code) for TravelTrex GmbH must be complete, correct and legible on the document – the details can be seen from your booking confirmation/invoice. The bank brand must be recognisable. The amount must be the same as the outstanding payment amount. Proof of payment shall not be a Word or other text document. There must be a notification that the transaction has taken place: e.g. screenshot from your Internet banking incl. a transaction code or a statement on paper signed by yourself, as well as stamped and signed by the bank. Your account balance must be recognisable and shall not be a negative amount. Open a "Word" document and paste the screenshot into the open space by pressing "Ctrl" and "V" simultaneously. Save the document to a hard drive, and attach it to an e-mail for sending it to us. After we have received valid proof of payment, we will be sending you your vouchers and holiday information from 14 days before the start of the holiday. How does payment occur via credit card? 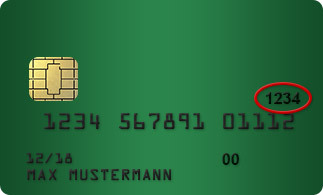 With Visa- and Mastercard the CVC-code consists of the three last digits in the signature box on the back of the card. 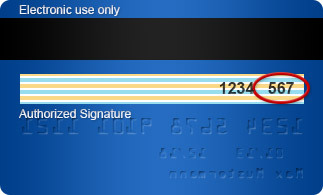 With American Express you can find the 4-digit CVC-code on the front side of the credit card above the credit card number. Please note that when paying with American Express a fee of 3% of the total holiday price applies. Payment made with VISA or Mastercard is free of charge. The processing of the transactions is done through our payment service provider, Stripe. Further information can be found here. Please note that as soon as you have completed your online booking, you will be charged $1.00 – this is to verify your credit/debit card. Once the transaction is completed, the amount will be immediately refunded to you. What do I have to pay attention to when travelling abroad (entry requirements, health regulations and Brexit)? Before you leave your home country, please make sure you have a valid form of ID with you (ID card or passport). A driver's license is not considered a valid ID if you have to pass border controls. If you are of a different nationality, have several citizenships, or travelling outside the EU, please keep in mind that may have to apply for a visa to go on holiday. This can take a few weeks and therefore should be done as early as possible. Should you need any documentation for the visa application, please let us know. Within the EU, there are no specific requirements to vaccinations prior to travel. However, it is nevertheless recommended to keep track of you vaccination history (in the event of an accident). Please be sure to inform yourself about the health regulations well before your travels. It is always a good idea to sort out travel insurance as to minimize the risk of high charges, should anything happen prior to, or during, the trip. During the booking process you have the possibility to optionally add various insurances to your holiday. Further information about travelling abroad within and outside the EU can be found here. Some general information about travelling abroad can be found on the website of the Foreign & Commonwealth Office. General information concerning Brexit: Here you can find advice on actions you may need to take if you're travelling in or to the EU after 29 March 2019. When and how will I receive the final travel documents? The final travel documents will be sent via e-mail from 14 days before the start of your holiday. The information and vouchers will be sent as a PDF document in an attachment to the e-mail. Should your computer not have Adobe Acrobat Reader installed, the e-mail will include a link to enable you to download the Reader for free. If you did not provide an e-mail address at the time of booking, you will receive your travel documents by post. The vouchers for accommodation and lift pass(es) are always issued only to the lead traveller, all other booked extras have each one voucher per traveller. Do I have to bring bed linen/towels? Whether your apartment is equipped with bed linen and/or towels, or whether these are available for hire in resort, can be seen in the accommodation description. Bed linen and towels are always included with hotels, pensions and gasthofs. How are the kitchenettes in the apartments equipped? Kitchenettes generally include utensils, pots, hob, and oven/microwave. Dish detergent and cleaning supplies - as well as toilet paper - should be brought along. Otherwise you may choose to purchase these items at the local supermarket. What should I take on holiday? Is there a packing list? I have booked a self-drive holiday. Will I receive directions to the resort? No. With your holiday information you will also receive a link to a free route planer and you can then identify the best journey from that. If you want to begin your holiday planning earlier, you can use our website: on the respective destination page you will find a tab called "Travel info" with a map and also a link to a route planer. What travel possibilities are offered? An overview of the offered types of travel, as well as more exact information regarding these, can be found here. What is the latest that I can check into the accommodations? Generally, check-in occurs in the afternoon of the day of arrival. More specific information can be found in your final travel documents and, if available, from your holiday rep at the destination. Should you be arriving after 6 p.m., you are required to contact the accommodation beforehand. How can I use the day of arrival to the fullest? We recommend you take a walk through the resort, shop, or take advantage of local leisure activities. Those wishing to ski can purchase a full or half-day lift pass locally. In all destinations it is possible to deposit your luggage, in France sometimes for a fee. Do I have to pay a tourist tax? In many resorts travellers must pay a tourist tax of between €0.20 - 2.50 per person/night. In Austria, the tourist tax is generally paid for through us and is therefore listed in the booking process; otherwise, this is found under "Obligatory Costs in Resort" for the selected accommodation. In France and Switzerland, the tourist tax is payable locally. Can I pay the apartment's deposit in cash or by credit card? It is preferred that the deposit be paid by credit card (MasterCard, Visa, American Express, Diners). However, it is also generally possible to pay with cash. When do I get the deposit back? Should the apartment be returned clean and without damage, the amount of the deposit will be restored to your credit card within a few days (max. up to 3 weeks). Cash deposits can be collected from the reception of your accommodation, or from your holiday rep(s) on the day of departure. Are ski or snowboard lessons offered? We offer ski and snowboard lessons in many of our resorts. If lessons are not available in the booking process, you can book these at a local ski school of your choice. In many resorts we also cooperate with affiliated ski schools which give you a 5-15% reduction when you book lessons with them locally. Where we have these reductions on offer, they are displayed in the included services of the respective accommodations online. Together with your final holiday documents you will also receive a voucher, which you need to present in resort at the ski school to benefit from the mentioned reduction. In which languages are ski and snowboard lessons offered? Besides the destination country's language, generally the lessons are also held in English. What type of board is offered? You have the choice between self-catering apartments, pensions with breakfast, and hotels with half-board, full board or All Inclusive board. The corresponding type of board is found in the information on our accommodation page. Board usually starts with the evening meal on the arrival day (if half-board, full board and All Inclusive are booked) and ends with breakfast on the departure day. I have booked board as an additional service. Where are the meals served? You will receive the additionally booked meals (booked as an extra) in a nearby-located restaurant or hotel. Check-out generally occurs on the morning of the departure day around 10:00 a.m.. You will receive specific information regarding check-out along with the final travel documents and, if available, from your holiday rep(s) locally. Can I ski on the day of departure? Should you wish to ski on the day of departure, with many of our offers you have the opportunity to extend your lift pass (for a small fee) at the time of booking online. You only need to select "7 days lift pass" during the booking process. You can also contact us via e-mail or telephone up to 1 p.m. (Mon - Fri) on the effective day before travel, or you can do so - at a greater charge - in the resort. Your luggage can be deposited in your accommodation (sometimes for a fee). In a few accommodations it is possible to shower after skiing (sometimes for a fee). How does the departure take place? If travel is booked through us, you can view all necessary information regarding your travel plans here. How can I cancel my booked holiday? You may withdraw from your holiday at any point before the start of the holiday. Cancellation requests must be made by the lead passenger and should be made in writing (e-mail). Cancellation fees will apply as described in our Booking Conditions (point 4). Further information can be found here. If you have an enquiry about cancellation fees in a specific case, please contact us via e-mail, with reference to the booking number, under cancellation-uk@snowtrex.com. Cancellations are accepted Mondays - Fridays during office hours. Should we receive your cancellation request outside of these office hours, the effective date of cancellation will be the following working day. How can I avoid cancellation fees? If, at the time of your cancellation, you identify an individual who will take your place on the holiday, there will be no cancellation fees. In this case, all booked services (with the exception of insurance) will be passed on to the new holiday participant. It may perhaps be worth changing the holiday to a different holiday date or destination. All relevant information about amending your booking can be found here. Can I amend my booked holiday (reg. date or place)? All information about booking amendments can be found here. If you would like to request an amendment for a specific booking, please contact us via e-mail, with reference to the booking number, under cancellation-uk@snowtrex.com. Does it make sense to book travel insurance (incl. cancellation insurance)? Travel insurance (incl. cancellation insurance) is so important that we are required by law to offer one. It protects you from the cancellation fees that incur, should you be unable to go on the holiday due to insured reasons, such as illness. As cancellation fees can be up to 90% of the holiday price, we strongly recommend taking out Cancellation Insurance. This will refund you the complete cancellation fees (less a small excess) when you cancel a holiday for an insured reason. Curtailment cover is included in the travel and cancellation insurances, in case you are forced to return home early from the holiday. How do I make a claim on my travel insurance (incl. cancellation insurance)? If you have purchased travel insurance (incl. cancellation insurance) and you have to cancel the holiday due to an insured reason, you must contact the insurance provider (not us), stating the number on the insurance certificate, to be reimbursed the cancellation fees. The number on the insurance certificate is identical to the Booking Confirmation number. You will find the contact details for the insurance provider on the insurance certificate. The insurance will notify you as to which documents are necessary (e.g. Cancellation Confirmation, medical report) to receive your reimbursement. Please note that a claim must be filed. How does the Refer a Friend Programme with SnowTrex work? Getting your friends, acquaintances or relatives excited for a winter holiday and financially benefitting from it at the same time? Start saving with our new "Refer a Friend Programme". All SnowTrex customers will receive a personalised referral link via email. This link can easily be shared with all friends who are interested. How do I benefit from referring friends? When you refer friends who have never booked with SnowTrex before, you will receive a voucher worth 5% of your friend's total holiday price. For example: The total holiday price of the new customer is worth £2,000, thus providing you with a voucher worth £100. In other words: The more friends you refer, the more affordable your next winter holiday will be - or even free! Prerequisite being that the person doing the referring is already a customer with SnowTrex. Everyone who is not already a customer with SnowTrex may be referred.A maximum of 8 friends can be referred per season. Should more than 8 friends be referred, a trade licence will be required. When and how will the voucher be sent? After your referred friend's holiday has been completed, you will receive a voucher with a special code via email. Should several friends have been referred, the value of the voucher will continue to increase until it is redeemed for your next booking with SnowTrex. Where and how can the voucher be redeemed? The voucher can be redeemed on the SnowTrex website during the online booking process for your next holiday. While making the booking, you can enter the voucher code in the corresponding field. The value of the voucher will be automatically subtracted from the total holiday price. Should the value of the voucher exceed the total holiday price, your holiday will be free of charge. Please note that the voucher cannot be combined with other vouchers or specials deals. Attempting to redeem the voucher after the booking has been made is also not possible. Further terms and conditions can be seen on the voucher. How long is the voucher valid for? The voucher is valid within the same season in which the new customer travels, and during the entire following season. Where can I see the current balance of my voucher? Where can I see how many friends I have referred? After the completion of each referred friend's holiday, you will automatically be sent an email with the voucher and its current balance. I've unintentionally deleted the e-mail with my personalised referral link. Where can I find the link so that I can continue to refer my friends? On the website for our Refer a Friend Programme you'll find an entry field. Simply enter your E-Mail address and we'll subsequently send you your personalised referral link. My friend forgot to click the personalised referral link before making their booking. Is it still possible to receive commission for this booking? The referred friend must book via the personalised referral link on our website www.snowtrex.co.uk in order to automatically assign the holiday to you. If you find a better price for the same holiday (with the exact same availability and included services) with a different tour operator, please e-mail this offer to us via bestprice-uk@snowtrex.com, before or on the day of making the booking at the latest. We will not only match that price, but better it by £9 per booking. Not valid when subsequently rebooking the holiday. Nevertheless, we are convinced that you won't find a better price/service ratio! What is the Snow Guarantee? If all ski areas which are included in the booked lift pass, are not open due to lack of snow five days before your departure date (effective day of arrival), you have the opportunity to change your booking to a different holiday for the same dates without extra charges (subject to availability of free rooms; current prices without Last-Minute & More discounts apply for the new holiday; valid for holidays with arrivals from 1st of January to 15th of March). To make use of our Snow Guarantee, please contact us on the 5th day (effective day) before the day of departure (e.g. Monday, if arrival day is Saturday) via e-mail under snowguarantee-uk@snowtrex.com. What are the accommodations that are called "Breakfast Pension plus resort name"? Should the property you are interested in have no specific pension name, but rather is called "Breakfast Pension + resort name", this generally means that you will first receive the specific details regarding your accommodation at the tourist centre in the resort. Our "Breakfast Pensions" are pensions in the village offering bed & breakfast, and cosy rooms with bath or shower/wc. We cannot guarantee that groups will be housed in the same property. What does "value price" mean when combined with a room/accommodation name? A few accommodations/rooms appear twice in the accommodation overview, once with "value price" and once without. Provided the room description is identical, we can offer you the same room at an especially low price. The two accommodation listings are of equal quality. Therefore, we recommend that you always check availability in the "value price" accommodations first. More information about searching for available rooms can be found here. What do the abbreviations SC, BB, HB, FB, AI and shower/wc mean? What is Crazy Booking Night? For our Crazy Booking Night, we have specially reduced offers online, but only for the mentioned date and duration. The reductions are always only valid for the advertised holiday dates, e.g. for pre-season or late season, or for specially selected destinations and they are already included in the offer price you see online during Crazy Booking Night. Bookings can only be submitted during Crazy Booking Night and only as long as the supplies last. Our Best-Price-Guarantee is of course also included with these reduced deals. As to be updated about the date and time of each Crazy Booking Night, we recommend subscribing to our newsletter, which can be done here. You will also find information about our Crazy Booking Nights on our social media platforms. Card transactions effected on SnowTrex are rendered secure by the Stripe payment system (www.stripe.com). All information exchanged to process the payment is encrypted using the SSL protocol. This data can neither be detected, intercepted or used by third parties, nor is not kept on our computer systems. Stripe is a technical service provider and does not take care of disputes linked to the orders. These should be settled directly with SnowTrex and/or your bank.